While they traditionally haven’t been my go-to for gaming, I’ve always had both a fascination and deep appreciation for rogue-likes. One of my favorites in the genre is Final Fantasy Fables: Chocobo’s Dungeon for the Nintendo Wii. What makes that game stand out for me is the pleasing mixture of rogue-like gameplay with more traditional RPG-style concepts thrown in (well, that and the lack of “permanent” permadeath). Having said all that, Fury Unleashed gave me a lot of similar vibes. 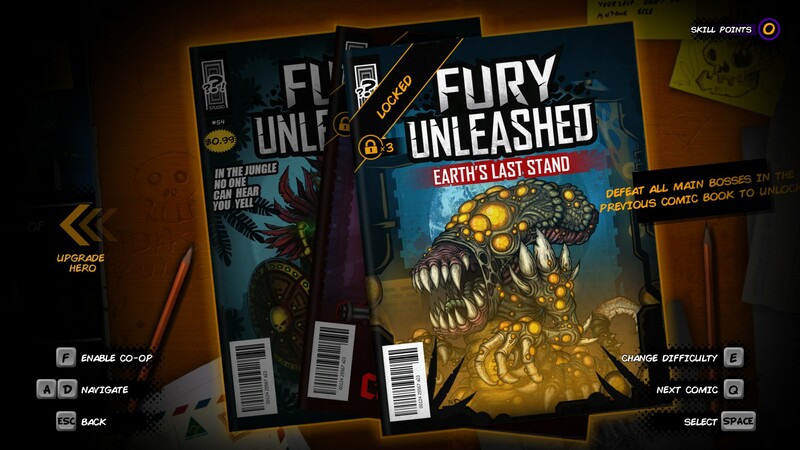 Make no mistake, Fury Unleashed is by no means an RPG. It does however blend those familiar rogue-like ideas with another, unrelated genre. The folks at Awesome Games Studio have taken a rather unique approach and gone for a union of rogue-like concepts and tough-as-nails platforming. Adding to this uniqueness is the way in which they present the game. 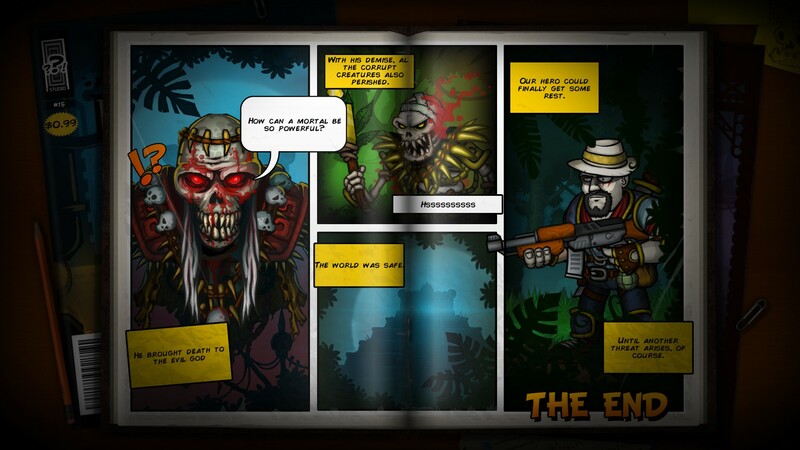 The entire game is meant to feel like an interactive comic book. The map is laid out to resemble a full-page comic, with each screen resembling a different panel. Since this is a rogue-like at heart, all of the screens and the enemies within them are randomized. Because of this, the “panels” will always be different in terms of size, orientation, and included content (e.g. enemies, obstacles, backgrounds). 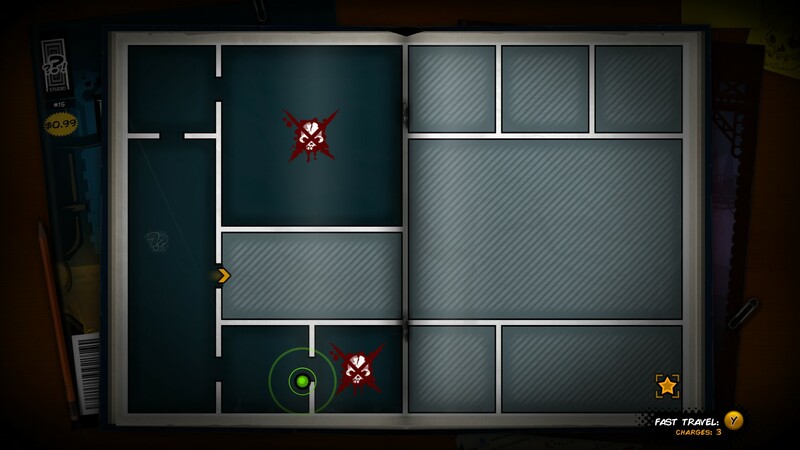 The structure of the map aside, there are a number of other neat features that give this game a nice comic feel. The enemy and character designs are all really well done, with nice shading work and colors that pop against contrasting backgrounds. The designs for the bosses in particular are very detailed and give off a sense of impending doom. Then there is the concept of absorbing ink as you lay-waste to enemies and rack-up combos. Black ink is used for acquiring new skills (e.g. increased HP, faster reload speeds, etc. ), red ink is used for replenishing HP, and yellow ink is used to increase your ability meter. While I found this mechanic to be quite interesting overall, it does have a slight issue. More on that issue in just a bit. In terms of sound-design, each campaign has but one looping track. While I can’t say that these tracks ever got on my nerves, they did leave something to be desired. One nice touch is that the music becomes more intricate and more upbeat as you build up your combo-score (accomplished by killing multiple enemies without taking damage). There is also a separate track used for mini-bosses and another for primary bosses. I like the way that the music reacts to how you play, but I’d like to see the developers add some additional tracks into the mix. Perhaps each level within a campaign could be given it’s own track. Alternatively, the tracks could be semi-randomized to make each time you play a little bit different. The gameplay itself is comprised of run-and-gun combat using a variety of weapons (all randomly distributed using treasure chests) and platforming to avoid deadly obstacles. I found that half of my deaths were directly related to these obstacles as opposed to from the enemies alone. Having random weapons, armor, and potions (which allow for special augmentations like bullets that freeze or poison your enemies) made each attempt for me a little bit different than the last. Sometimes I’d end up with a rocket launcher, other times I’d end up with with a revolver. You also have a unique ability which you can charge up using yellow ink. This allows for some special approaches to combat, such as freezing all enemies on screen or going into a slowed-down, bullet-time mode. Perhaps now would be a good time to shift back to that aforementioned “ink issue”. 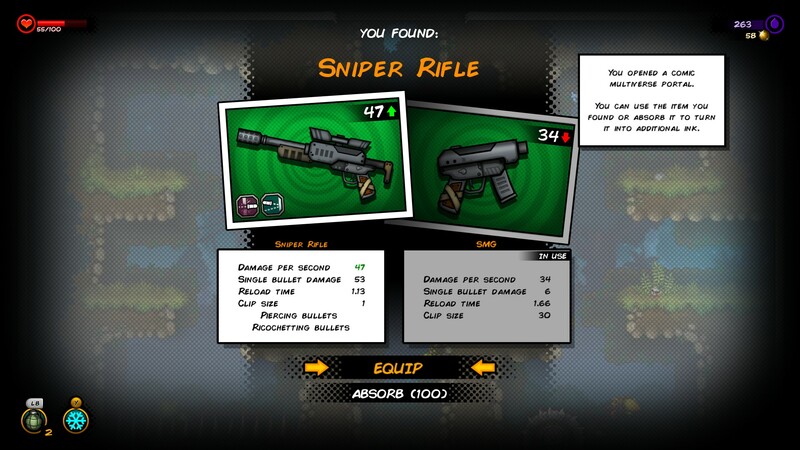 One of my main reservations with the game as it currently stands is with the rate at which you collect black ink. While you tend to earn a decent amount of it for each kill, the amount needed to upgrade skills can be quite staggering. On average, a single play-session for me lasted about 2 hours. During that time, I was generally lucky to amass enough of this black ink to gain 3 skill points. These points are crucial for unlocking new upgrades for your character. 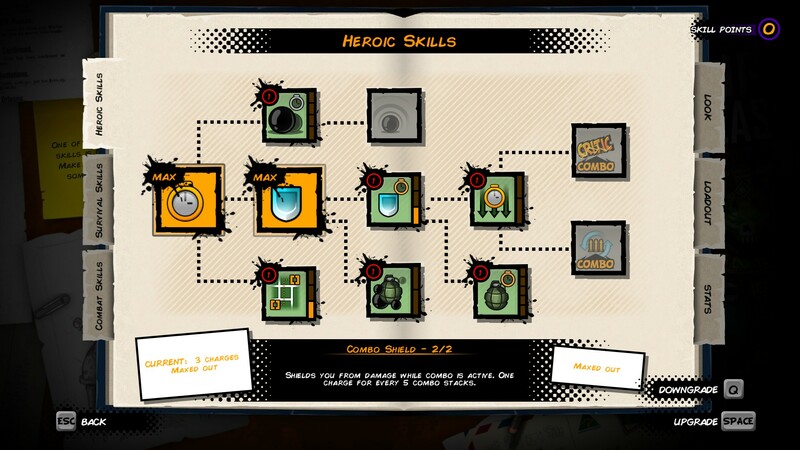 Each skill (after its initial level) begins requiring more and more skill points to upgrade to its next level. Since the damage you deal and the damage you can sustain vary depending on what random weapons and armor you find while playing, you need to rely heavily on upgrading your skills to progress. The rate at which you gain this ink does increase as you rack-up kills, but the multiplier never went past x2 despite my combo-score continuing to increase. What I find to be most aggravating about this ink issue is the fact that you need to defeat all the main bosses in the one campaign before you can unlock and move on to the next one. In order to do this, you need to survive 3-4 randomized stages, potentially encounter multiple mini-bosses, and then defeat the main boss. Nearly every time I made it to this main boss, I was extremely low on HP. You can increase the drop rate of red ink to regenerate HP, but I found that this ink was always in short supply and never regenerated enough to give me a fighting chance. If you learn a boss’ patterns though and you are fairly adept at platforming, you can defeat it. Once defeated, you move on to the next campaign. But hold-on a moment; as soon as you die, you are unable to return to that next campaign unless you’ve played through the first enough times to defeat each of the three, unique main bosses. That’s right; if you defeat the “main boss”, you’ve really only beaten one of them. In the 15 or so hours that I put in, most of those were spent grinding in the same campaign to unlock the second one. Make all campaigns available at the start without the need to unlock them. Shift focus instead on expanding options for new skills, upgrades, and customization options. Despite my harsh words, I think that this game is overflowing with potential. I think that the mixing of the two genres has been done exceptionally well and I feel that it is very competent as a platformer. The boss fights were both exciting and challenging and I’d love to see more of them. One in particular had me dodging a multitude of colorful projectiles and made me question whether or not I was actually playing Radiant Silvergun. I think that if the developers fix some of the kinks like the lack of a proper death animation, the sometimes buggy shop menus, and the leveling issue, this game will be quite impressive when it sees its official release next year. Oh, and Joy-Con support is a must for the Switch version so that I can play co-op with my friends on the go.